The 3rd eye chakra governing eyes and the base of the skull, this chakra is linked with headaches, visual and neurological problems. 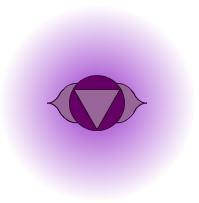 A balanced 3rd EYE chakra allows you charisma and intuition, a vision beyond material things and the gift of second sight. Sexual energy-you no longer need another person to complete yourself.